Carlyle Dental offers wisdom teeth extraction for residents living in Kinston, Goldsboro, Greenville and the surrounding areas of North Carolina. A wisdom tooth extraction procedure is the removal of four permanent molar teeth located in the back of your mouth. Often, a wisdom teeth extraction is needed in order to correct existing problems. This procedure is used to prevent future difficulty that can be caused by wisdom tooth growth. The jaw is often not large enough to accommodate wisdom teeth, and they can become impacted, unable to break through the gums, or can emerge at an awkward angle. Wisdom teeth can partially break the gum line, at which point a flap of gum tissue grows over them, creating a pocket where food and germs can become trapped, leading to infection. Impacted or infected wisdom teeth can lead to serious health problems, including cysts, and can damage the surrounding bone or teeth. Removal of wisdom teeth resolves these problems, prevents potential infection and reduces crowding of the back teeth. 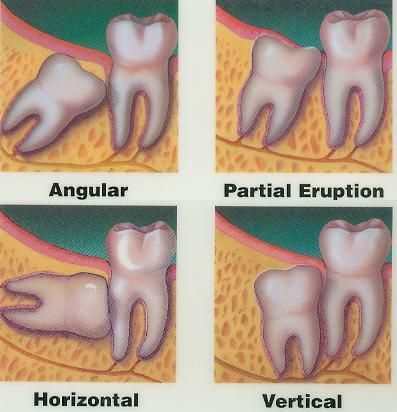 There are a number of factors that may influence your decision to have your wisdom teeth extracted at Carlyle Dental. Extraction may be necessary if you are already experiencing problems with your wisdom teeth. However, many people do not experience issues with their wisdom teeth, and once you are over the age of 30, the risk of developing problems is minimal. The root of the wisdom tooth are not fully developed in younger patients, thus causing many issues. Typically, these teeth are easier to remove with a quicker recovery period. Preventative removal at a young age might be desirable. As with any surgery, there is some inherent risk, such as possible complications including a dry socket, infection, numbness, and bleeding. Individuals with progressive medical conditions may want to consider wisdom teeth extraction while they remain healthy. Wisdom teeth extraction may be done with local anesthesia. However, if you are having all four extracted at the same time, sedation dentistry is recommended. Dr. Carlyle may need to open up the gum tissue covering the teeth, and remove connecting bone and tissue prior to removing the tooth. If the tooth needs to be cut into smaller pieces for easier removal, stitches may be required. Recovery usually only takes a few days. Painkillers are often prescribed, and symptoms such as bleeding or swelling are managed with regular gauze replacement, cold compresses, and warm salt water rinses. You will be advised to rest and relax after surgery, eat soft foods for a few days and keep the mouth clean. If you are a smoker, it is recommended not to smoke during the healing process. Dr. Carlyle will examine and perform an x-ray of your wisdom teeth. Once a determination has been made, Dr. Carlyle will discuss treatment options with you. Carlyle Dental is committed to easy dental care that is affordable and anxiety free. Our goal is to make your wisdom teeth extraction as easy and painless as possible. How Much Does Wisdom Teeth Extraction Cost at Carlyle Dental? The cost of wisdom teeth extraction varies depending on the extent of treatment necessary. We accept cash, MasterCard, Visa, and personal checks. Most insurance is accepted. We also offer financing through CareCredit® and Compassionate Healthcare Services®. Why Choose Carlyle Dental for Wisdom Teeth Extraction? For emergencies, please call our office at 252-624-9698. A member of our staff will schedule an appointment with you.